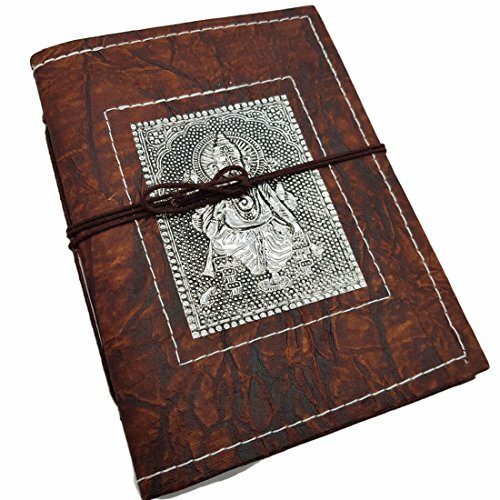 JAIPUR NAGRI an Eco-Friendly Handmade Leather Journal with Beautiful Cover. The Journal Is Consisting of Handmade Sketch Papers (Khadi Papers). It's A Refillable Lock Journal With 100 Pages. Every Page of This Diary Will Become A Gem with Your Precious Memories. Usage: Personal Journal, Gift for Women, Gift for Men, Holiday Gift, Mother's Day Gift, Father's Day Gift, Birthday Gift, Valentine's Day Gift, Vintage Collection. The Journal Is Made of Leather and Drawing Papers Which Should Be Protected from Water. Keep Your Notes Intact in Such Elegant Manner. Organizer/Planner Can Be Carried to Interviews, Meetings or Personal Use. This Is Elegant Multi Pocket Organizer / Planner with Multi Compartments Like Diary, Appointment Etc. From Jaipur Nagri. And Attractive Interior Includes Credit/Business Card Holder and Pen at Such Making It Must Buy. Save Your Amazing Memories, Record Your Wonderful Life with This Dairy! A Very Beautiful Gift for Yourself or Your Friends. With Its Handsome Built Quality & Vintage Classic Finish It Will Attract Many Looks. With It's Thicker Than Usual Pages, It Can Take Being Written on With A Fountain Pen Without Worry of Bleeding or Smudging! Blank Craft Papers Are Perfect for Writing, Drawing, Stick Photos or Articles. • Handmade paper & cover. Best gift. • This Diary Gift Is easy to carry. • Highly Durable & Functional, This Decorative Record Book Can Be Used For Writing, Noting & Jotting, Sketching, Doodling Or Recording Personal As Well As Professional Activities and also for gifting. • Comes With A Front And Back DIfferent Designs & 100 Pages Of Unruled Handmade Papers if counted both side including covers. If you have any questions about this product by Jaipur Nagri, contact us by completing and submitting the form below. If you are looking for a specif part number, please include it with your message. DRAEKK – The CONCEPT24 Planner: Best Personal Development Journal for Goal Setting, Productivity, Weight Loss & Time Management. Get Fit & Focused - Workout Tracker, Food Log, Daily & Weekly Agenda.